And now, a trio with a really, really big future filled with a new sound. Here they are.... The Honeybees! They don't write 'em like that anymore. OK, not everyone's going to like the music - but watch the video and tell me you wouldn't visit the place if it was a pipe club. Do you like celery? ---Yes, I do. Do you like soda? ---Yes, I do. Do you like celery soda? I had some craft made celery soda the other night. Ya know what? It wasn't as good as Dr. Brown's. The waitress was all, like, "I know it sounds weird but it's really good and refreshing." I told her, "You don't need to sell me on celery soda. I'm in. I hope it's as good a Dr. Brown's." She had never heard of Dr. Brown's. Pffffft. Hipsters.....They think they've reinvented the world. Dr. Brown's Cel-Ray goes down smooth with a good machine made cigar. Ask anyone. You sir, are an interesting individual. I have already informed my wife, that if/when we visit New Orleans again, that we are looking up Mr. Whalehead King’s fine establishment! That would be very nice. I'm trying to get in the top 15 places to stay in the world instead of just the measly top 20. By the time you get here, we should have our operation down to a science. 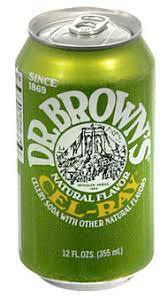 Remind to have some celery soda on hand. I'm not posting this for the documentary, though that is kind of interesting if you are interested in what it might be like to eat only potatoes. Our song today plays in the background for the first 6 minutes and then picks up again, triumphantly, at 8:40. I'm posting it for the music in the background, which is today's song of the day. I think it's an interesting juxtaposition to use this song in this context, a situation that is very, very, very different from it's first appearance in film. Do you recognize it, O my droogs? I'm thankful the potato guy didn't pick the William Tell Overture for his soundtrack. That wouldn't be appropriate for this forum. This song of the day is dedicated to all pipe smokers because . . . well . . . underneath we are all blue ribbon winners. It is very difficult for one to sing a duet with oneself. Do your work well. Do it honestly. Good things will follow. This is the secret of civilization, made up of many parts to keep everything cued up, functional, and in proper order. Bum-Ba-BAUM-Bah-baa-BAUM-DAUMB! The world is make up of working folks. God bless us, one and all.